Riverview's Leading Ceiling contractor can handle all Popcorn Ceiling Removal, Popcorn Ceiling Repair, Drywall Repair, and Texture Ceilings and Walls needs. We bring the same attention to detail of interior ceiling and wall textures, as we do with the same quality of service we offer our full line of interior wall painting and ceiling painting services. Using the best wall compounds and materials available, along with texture ceiling and wall experts. Drywall Repair, and Texture Ceilings and Walls before interior painting can be a tedious job, especially for odd-sized or hard to reach areas. Ceilings textures can be especially tough to repair, and Riverview Ceiling Contractor can update your interior ceiling with popcorn ceiling removal and ceiling textures to a new uniform look. Arrow Ceiling, Riverviews Leading Ceiling Contractor can do the job right, rejuvenating your home's interior ceiling and wall textures and painting, ensuring your satisfaction. Contact Arrow for your interior ceiling and wall needs, and we will gladly provide you with a free estimate. We offer Popcorn Ceiling Removal, Popcorn Ceiling Repair, Drywall Repair, and Texture Ceilings and Walls. 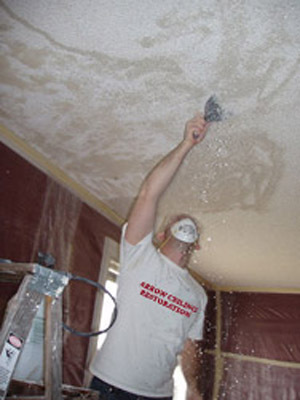 If you're looking for a Riverview Florida Ceiling Contractor Specializing in Popcorn Ceiling Removal, Popcorn Ceiling Repair, Drywall Repair, and Texture Ceilings and Walls, contact Arrow Ceiling Restoration today at (813) 840-3717, or complete our estimate request form.